When Barry Allen escapes the temporal singularity he jumped into in The Flash Season 1 finale, he won’t get to rest for long. A new challenge will come in the form of Atom Smasher, a superhero from the comics whose been made a bad guy for his live-action TV debut. 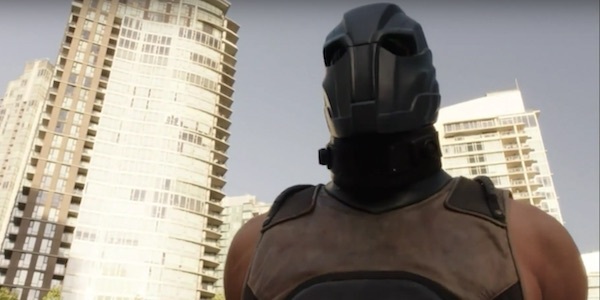 Now we have our first look at Barry’s new adversary in the first promo for The Flash Season 2. As with most TV superhero and supervillain costumes, Atom Smasher’s suit and mask have been adjusted to look less colorful and more realistic, but there’s no mistaking that’s him in the preview. Underneath the mask is ex-wrestler and Haven star Adam Copeland, a.k.a. Edge, who will first appear in the Season 2 premiere. The getup looks similar to what General Wade Eiling wore when he was being mind-controlled by the telepathic gorilla Grodd in “Grodd Lives,” making me wonder if those two shop at the same mask stores. Atom Smasher will come to Central City to try to kill Flash using his super strength and ability to increase his size, making him one of Barry’s toughest opponents yet. Unable the defeat this gigantic foe on his own, the Scarlet Speedster will need to bring the entire S.T.A.R. Labs team together to get the job done. Although the character made cameos in the animated series Justice League Unlimited, The Flash is without question his biggest appearance outside of the comics. Atom Smasher’s alter-ego Albert Rothstein was previously mentioned in the episode “Power Outage” as one of the casualties of the particle accelerator accident, so like Ronnie Raymond and Martin Stein (a.k.a. Firestorm), he may have actually survived and gained cool powers. On the other hand, Season 2 will introduce Earth 2 and several of its citizens, and for all we know, that singularity transported Barry to the parallel world. Who's to say that this Atom Smasher isn’t the Earth 2 Albert that is still living? Either way, because Atom Smasher is a member of the Justice Society and several other benevolent teams in the comics, it’s hard to imagine him being a straight-up supervillain in the TV series. Instead, his hostility towards Barry may be misplaced, and eventually the two could resolve their differences and work together later in the season. You can check out the full oh-so-short preview below, which includes a glimpse at what may be a Flash Signal. We’ll see Atom Smasher in action when The Flash Season 2 premieres on Tuesday, October 6 on The CW.